The subtle anhua (hidden decoration) technique was used from the fourteenth century onwards on a range of Imperial ceramics. The five-clawed dragons here suggest that, despite this bottle remaining unmarked, it is an Imperial product, as were so many unmarked wares. This seems confirmed by a bottle of very similar shape, also with anhua decoration, illustrated by R. Hall, Chinese Snuff Bottles. Masterpieces from the Reitberg Museum Zurich, pp. 36-7, no. 12. A second bottle with underglaze-blue decoration, also of similar form and with a wide neck, is also in the collection of the Reitberg Museum, ibid., no. 11. 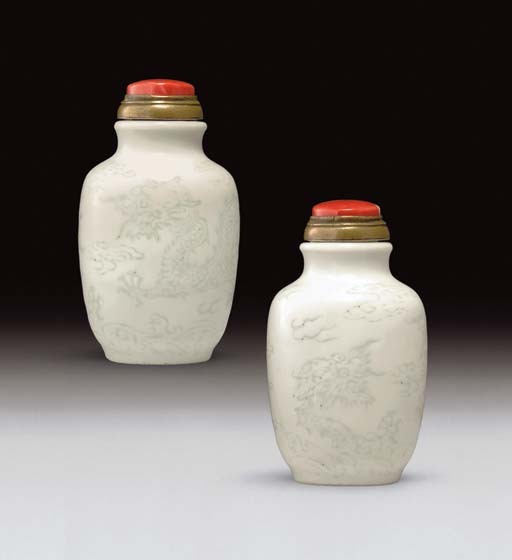 Both bottles bear late Qianlong marks, providing evidence that the wide-mouthed form more commonly associated with the first half of the nineteenth century may be traced back to the Qianlong period.